Gauging the amount of widespread information available today may have you thinking office spaces must be metaphorical beehives — buzzing with borderline instinctual, relentless efficiency and productivity. While design commercial interior design strategy may be a common subject for the corporate crowd, actually putting that knowledge into practice is an entirely different beast. Over the past couple of years, we’ve completed numerous interior commercial builds for our clientele. Our main goal is always to improve environmental factors that elevate office structure and growth – but it’s the little things that matter most. 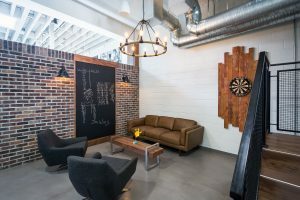 Here’s our greatest hits list of three recent cutting-edge tech/law office builds that Aura Office Environments has helped transform. Proudly serving the west side of Vancouver, Burnaby, Richmond, and New Westminster, Westside Family Law HQ lies in the heart of the South Granville neighbourhood. They came to Aura looking to revitalize their office space to usher in a new era of customer service and project a renewed brand identity. We tackled this law office revamp using a three pillar system, addressing each issue with our trademark innovation and creativity. The existing Westside Family Law space wasn’t cramped by any stretch, but its footprint presented a unique challenge in that there was no buffer or transition zone from the lobby to the offices of the business. We developed a fresh and modern design using reclaimed and salvaged cedar timbers in a dynamic, angled floor-to-ceiling partition to add warmth and humanity. Using these eco-friendly and reclaimed materials helped develop a unique identity synonymous with second chances and helped to create pivotal transition zones in the space. It’s all about the little touches. Offices aren’t the boring, stale spaces they were during the corporate cubicle surge of the 1950s; today’s cutting edge modern spaces require a zest of life that helps differentiate them from their predecessors. Office art is a staple of any space, but we chose to present geographic representations of Greater Vancouver, the ocean, and the temperate rainforest in a unique way by suspending canvases from the ceiling, rather than have them conventionally hung on the wall. The result is a much taller space, helping the eye gaze upward and to a more modern installation process. Materials are every bit as important as the layout of a cutting edge office environment. We used a polished concrete to create a flashy focal point for clients entering this new space. Polished concrete is an incredibly hot material right now in many aspects of architecture and home design. We used strong linear lines to help create an artistic juxtaposition from the reclaimed timbers behind the receptionists’ desk for a powerful intersection of organic and industrial textures. The Owen Bird Law corporation is a full-service law firm located in downtown Vancouver. When we began working with this well-established brand, we integrated an office aura plan to maintain the traditional energy of the space, while integrating modern technology, some modern aesthetic changes, and successfully utilized the panoramic view of the city to bring the outdoors in. We needed to help the space feel more open and inviting, so the team at Aura worked to select a unique carpet pattern that was both warm, modern, and assisted in carrying the eye throughout the space, rather than creating a solid block of texture on the floor. The result is an opposing linear carpet that creates a vibrant, stone-like appeal that carries throughout the lobby and private office settings. 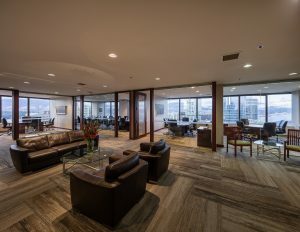 This is an established and respected brand, and the team at Owen Bird were adamant that they pay respect to their past, and to the traditional pieces that help identify the space as a key player in the Vancouver law community. We integrated traditional pieces like leather chairs and sofa sets, dark and warm desks and wood accents, and modern neutral colour palettes with modern technology, and innovative modern accents here and there to update and differentiate the appeal of this stately and dignified space. We borrowed some of the ample daylight projected into the space via the large floor-to-ceiling glass windows in an effort to help Owen Birds’ clients feel welcome. A view from an office is rarely as stunning as the one from these windows, so we embraced the water view, the mountains, and the urban centre below to solidify a stunning aesthetic that informed much of our material choices for the rest of the space. Brand Alliance is a North American leader in promotional marketing. They began as a Canadian grassroots company and soon expanded to work with some of the most respected and biggest brands in Canada. They hold a very strong dedication to environmental standards, strengthening community, and social compliance to develop their brand as a good neighbour involved with many local, national, and international charities. The came to Aura invested with a belief that their space should represent their brand, and we jumped at the opportunity to work collaboratively with this like minded creative team. We used vibrant colours in furniture, and furniture accents to reaffirm Brand’s dedication to multiculturalism, diversity, and flavour in the workplace. Using colour in this regard is a surefire way to develop a reinvigorated, fresh space with little time or investment. We created more open and airy seating areas for both staff and clientele to communicate openly. With greenery and a nice view as a backdrop for our revamped seating areas, this office space encourages inter-office creativity, open collaboration, and chance encounters that build upon a legacy of close-knit teams and enviable company culture. We built a rooftop patio to assist in developing a dynamic work-based approach to work/life balance, giving the team a place to escape the hustle of the office and recharge their batteries, while simultaneously creating an in-house lunch/break room that’s comfortable, inviting, and peppered with sleek modern touches like innovative media/tech and clean modernist lines. Using an aesthetic that blends old industrial remnants found in their building like brick, exposed beams, and mortar, we integrated glass walls to keep the space open and inviting, while using warm wood accents and doors to continue a made-by-hand approach to the office design to incorporate the grassroots and human beginning of this continental powerhouse business. Retro style played a big role in our environmental influences during this build, ushering in a sense of playfulness, humanity, and community. Littered with modern furniture pieces and comfy, warm leathers and pleasant fabrics, we think we hit the nail on the head. Designs for cutting-edge offices are as varied and as engaging as they come. They’re all about integrating employee satisfaction, work/life balance, and corporate efficiency into a realm of innovation, creativity, and vibrancy. Further to the psychology of the office, the modern landscape of commercial office design is all about bringing the outdoors in, seamlessly introducing new technology, and making a statement about your environment. After staff, office space is likely the biggest expense felt by most growing tech companies. As demand grows and so does your staff, office space utilization becomes a hot commodity. Knowing that you’re using your existing space in ways that support and suit your growing needs is key to making use of every square inch of the space you have. Making adjustments to office aesthetics by altering furnishings and floor plan strategies that improve space utilization from horizontal to vertical is a good place to start. Storage, organization, decluttering, and repositioning space to suit the changing demands of an ever-evolving workforce can hugely help growing tech companies to develop their offices into spaces that suit their changing needs. What is Office Space Utilization? Office space utilization is the process of understanding how and why existing office space is used, and underused by its organization, and combating wasted space with new ways to better utilize extra square footage through redesign, re-imagination, and shifts to layout and existing spaces. The majority of modern tech office designs are activity based working (ABW) offices and they’re continually growing in size and scope. These types of office spaces are divided into different areas to support different working styles and tasks. This allows staff to pick and choose where and how they choose their time, and lends itself well to determining which spaces are taken advantage of, and which ones can be placed on the chopping block to better utilize the space. When companies take stock on continual space utilization measurements, they’ll begin to see trends and collect data to help save space, energy, and costs. Once or twice per year, measure space utilization to help identify areas that can benefit from further development, and make corrections to address usefulness and productivity. Horizontal office layouts are inevitable. People need space to work and space to move around. But office space utilization is as much about practical storage solutions as it is useable work environments. Transitioning existing storage solutions that get in the way of everyday employee traffic aren’t very practical, or an efficient use of floor space. Vertical storage solutions are organized, space efficient, and allow growing tech companies to make use of freed up floor space for collaborative work spaces, or private work zones to hire new staff to keep up with demand. As the millennial workforce continues to dominate the employee landscape, more and more eco-friendly staff will end up biking to work as a way to reduce their carbon footprint and save money. An increase of bikes in the office space can be easily combated – and aesthetically pleasing when vertical wall storage for staff bikes is implemented in entrance ways and/or common areas. The aesthetic is charming, gives a sense of the identity of the office, and gets a bunch of bikes up and out of the way. Cloud storage technology and digital file sharing has largely done away with the majority of physical paperwork, especially in the tech sector – so eliminating old school filing systems is another great way to free up some traditionally spoken-for space. Use vertical shelving units to store tech-related publications and references for employees in a vertical manner not only saves space, but it also gives eye-level access to employees seeking information. Sometimes the office outgrows mismatched furniture or items that take up too much space. Agile interior design in the office is meant to boost square footage, accessibility, and productivity by giving employees the ability to choose where, when, and how they work, eliminating any shred of preconceived obligation to sit at a specific desk location all day. Eliminate the majority of stand-alone desks, and increase floor space and freedom for your growing staff. Collaborative work zones, open concept common space, and private zones demonstrate agility in the office by re-evaluating existing floor plans and optimizing office space by allowing people to be mobile, to change one’s surroundings, and to explore differences in working environments. If your collaborative spaces are being used a lot, but quiet spaces are seldom used, make some changes by better utilizing some quiet space as additional collaboration space in an effort to make room and ramp up productivity. Agility in your floor plan uses a combination of adaptability and mobility to encourage employees to use existing space in ways not traditionally supported. When tech office space layouts embrace human personality and spirit, style, efficiency, and practicality often emerge. Modular furniture options re another fantastic way to maximize office space utilization. Modular furniture is mobile, portable, and multipurpose, allowing it to take the place of multiple bulky furniture pieces. Height adjustable desks and privacy walls are perfect examples of space-savvy furniture that can quickly and easily transform spaces for growing teams while keeping the bulk of traditional furniture to a minimum. When your tech office design isn’t working, it’s costing your company money and stopping your staff from having access to the space they need to maximize their efforts. As your tech company grows, spaces will inevitably have to change as demand for more optimized working environments becomes more and more noticeable. The first step to maximizing office space utilization is always taking a step back to recognize what you’re dealing with, and where advances can be made. Don’t be afraid to change things up, it’s good for you. These days, there’s a wealth of opinions and info available about how to design and host effective meetings – but not a lot of info on how to design an effective boardroom. In order to impress , stakeholders, and clients, board room designs have to have serious impact, and while video conference calls and virtual meetings may be on the rise, a professional and modern board room is still a core piece of organizational identity. Effective and powerful meeting spaces hold the power to affecting and influencing how your business is perceived by your partners, competitors, and clientele, which is why boardroom design is such a surprisingly important aspect of modern office design. Here are our top picks of client-facing board room ideas that have serious impact on their businesses, their brands, and their success. The world is becoming increasingly interconnected through digital and mobile technologies, so state of the art digital media and audiovisual communication technology is critical to the success and effectiveness of any boardroom design. Rooms with adequate technology are used 5X more often that rooms without, and Herman Miller Research tells us that limited technology causes smaller conference rooms to be used only 10% of the time – so some key pillars of required tech should be screens, displays, and communication devices – but different organizations will require different tech in their spaces, so suit according to your specific needs. Technology can also be used to implement effective and streamline booking efforts to alleviate conflict and accidental double-occupancy of a space to improve investor perception of your company’s internal organization. Physical environments are extremely important to the positive impact of your boardroom spaces. Conference and boardrooms typically benefit from brightness and alertness, and as such the impact of colour and lighting play big roles in the perception of a space. It’s been found in innumerable studies that natural light affects the cognitive performance of the brain and causes us stay alert and engaged longer. The ideal boardroom is situated close by a view of nature, and/or allows ample amounts of natural light to flood the space – artificial fluorescent lighting can contribute to meeting attendees feeling drowsy, unmotivated, and frankly, bored. Choice of furniture and feature materials can play a massive role in the way a boardroom impacts its occupants. Aesthetically, there are many different ways to ramp up the visual appeal of your boardroom. Modern design themes implement brushed metals, glass, leather, and crisp monochromatic colour palettes to exemplify a space that’s up-to-date, professional, and efficient. More comfortable and laid-back boardrooms can successfully utilize materials like wood and stone to portray a more organic and authentic atmosphere. Alternative to visual aesthetics, materials like cloth, microfiber, and felt can play a role in the physical comfort of boardroom occupants. If the room isn’t comfortable, it will prove difficult to achieve the desired results from those who use it. Modern conference and boardrooms are chronically ill-equipped and underused. Herman Miller Research tells us that out of a standardized 12 chairs, only 3 or 4 are occupied at any given time, meaning that the quintessential boardroom is much too large, and that gives the illusion of an unmotivated, absent, or disengaged staff. Working in and implementing smaller boardroom spaces not only saves physical space contributing to a wealth of other office space uses, but it can also contribute to increased efficiency, connectivity, and productivity. Smaller, more versatile boardrooms and meeting places are ideal for surprise meetings, unscheduled huddles, and conference calls. Your core values and brand need to be reflected in the design of your boardroom. A great way to do this and simultaneously inject your boardroom with a zest of professional aesthetics is to add a video background display that reflects the spirit of your brand. It represents a great way to get creative and put some innovative thought and reflection into your space. For example, rather than a massive logo, consider the video conference background in your boardroom with the Why statement of your business, or a quote or mantra delivered by your company founder, or an influential figurehead of your industry to help exemplify your brand’s dedication to greatness. Use company colours in this important background wall, get creative with textures and try to exemplify a digital presence that helps raise your brand to new visual heights. It’s critical that your business is able to grab hold of investor and stakeholder attention in the increasingly competitive and fast-paced business landscape of 2018. Board room design idea that have serious impact are all about colour, light, digital tech prowess, and ensuring that the physical spaces themselves are conducive to collaboration, efficiency, and professionalism – ensure your space is positioned on those pillars, and you’ll have to trouble impressing the key prospects of your business.